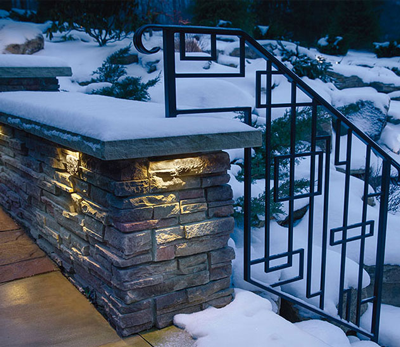 Today’s LED landscape lighting is versatile and quick to install. The long-lasting bulbs reduce maintenance costs, while energy-efficiency saves on your utility bill. Depending on your property and personality, you can set different moods with the lighting that you choose. We’re used to seeing light shine down from above, either from the sun or moon. LED landscape lighting placed in trees and shining down creates a romantic, natural lighting effect perfect for gardens and gathering spaces. As the light filters through the trees, it creates interesting shadowing patterns of the branches onto the ground. To highlight an architectural detail or outdoor sculpture, dramatic uplighting creates a striking effect. Spotlights shining from the ground up are noticeable and unusual because we naturally expect light to shine down from above. We refer to spotlighting as delivering a “Hollywood effect.” For instance, if you have stone or brick on your house, we suggest placing an uplight very close to the wall. The light will skim the brick or stone, creating dramatic shadows. Another beautiful effect is to uplight an ornamental tree or shrub that serves as a focal point to your landscaping. 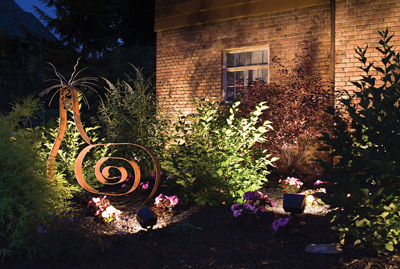 Another type of LED landscape lighting involves placing lights within your hardscape to create pleasing atmospheric lighting for parties and outdoor gatherings. It’s just right for seeing to cook, eat and enjoy conversations, but also allows you to enjoy the ambiance of the evening. 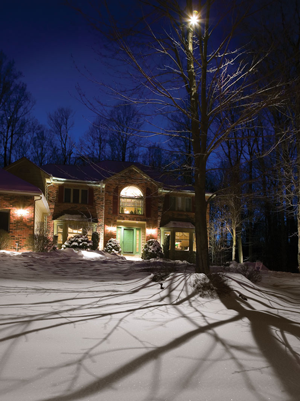 Fall and winter are great seasons to install landscape lighting– especially before your holiday gatherings. Give us a call to start your landscape lighting design plan– and to start setting the mood on your property.